As you know from day one all our fire pits have been designed to be used with a water fillable under tray of which we manufacture and stock for every model in our range. Lawn and deck safety is paramount and we have proved that if our fire pits are used with the water fillable under tray on lawns and decks no damage to either occurs (provided the water is maintained in the water fillable under tray at all times). You can check this out by visiting us at an expo we show at regularly or from our many videos showing our fire pits being burnt on lawns and timber decks. So to build just a stand only for our fire pits seemed not enough of a challenge. After all few bricks stacked underneath would do the same job. Though realistically you won’t find bricks when you want them and who really is going to carry them around just to prop up a fire pit. So it had to be more than just a stand. Challenge accepted we said. As you know our products are designed with multipurpose end use in mind and that’s where we came up with THE WEDGE FIRE PIT™ STAND & ORGANIZER for want of a better name. What we have invented and released tackles two fronts, firstly we have achieved a stand that you can sit our under tray on for the 450, 450XPWB, 500AE, 600, 600XPWB, and 600AE model WEDGE FIRE PITS™ which are our most popular touring models likely to end up in a caravan park. Secondly it has a host of unique storage and safety features as well. 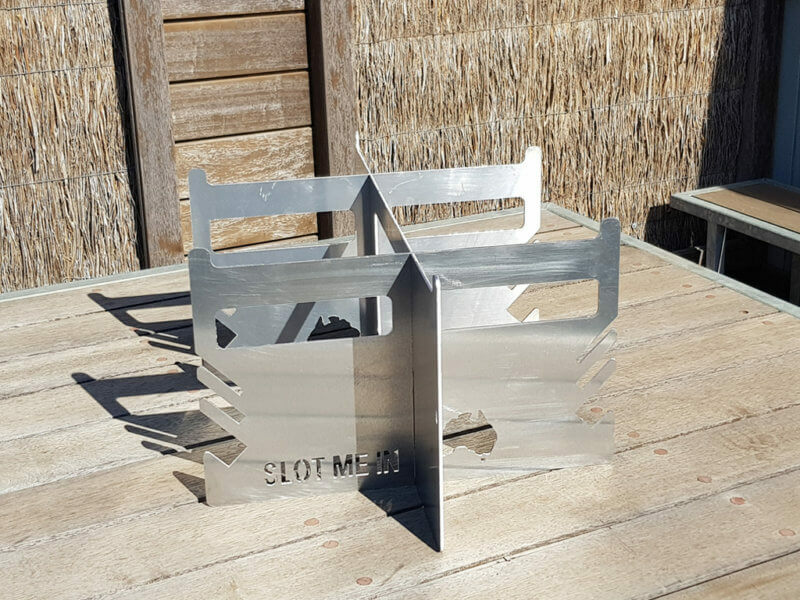 You can store the cookware support bars, spit rotisserie support brackets, multi-tool, grip ‘n’ flips and long bbq tools and it even holds up to 2 hot plates and 4 grills all at once as well, all on the WEDGE FIRE PIT™ STAND & ORGANISER by SLOT ME IN. Next was the choice of material and we went with 100% Aussie aluminium to keep the weight down. All up THE WEDGE FIRE PIT™ STAND & ORGANIZER weighs just less than 4kg. The design speaks for itself, consisting of 3 separate pieces of precision laser cut 4mm thick aluminium that store as a “FLAT PACK” taking up next to no room and then simply “SLOT” together as our name suggests SLOT ME IN. Better still NO TOOLS OR FIXINGS ARE REQUIRED FOR ASSEMBLY which takes a matter of seconds to do. Finally a very important safety feature are the 6 raised points (with smooth rounded edges) that positively locate the under tray in position before putting THE WEDGE FIRE PIT™ on top so it can’t be bumped or slide off the stand and is automatically centralized to start with as well. Look for future Social media updates in YouTube and Facebook with videos and images of its use and assembly as well. Or come to an expo and see it in use and get your very own. Our first expo for 2019 will be the OUTDOOR LIFESTYLE EXPO LAUNCESTON 2019 from February 1 – 3 at the Launceston Showgrounds, Invermay, Tasmania. See you there where we will be with OUTBACK CAMPERS. Available now only from SLOT ME IN direct on our website store exclusively at this stage for $209.00 plus shipping costs. SLOT ME IN™ Aussie Rocket Stove AE™ (Hikers & Bikers™) Edition. Introducing Australia’s if not the world’s FIRST and ONLY true commercially manufactured “FLAT PACK” full “ALUMINIUM” rocket stove made right here in Australia by SLOT ME IN™, the all new SLOT ME IN™ Aussie Rocket Stove AE™ “Hikers & Bikers™ Edition (AE™ for short) using 100% Aussie materials. 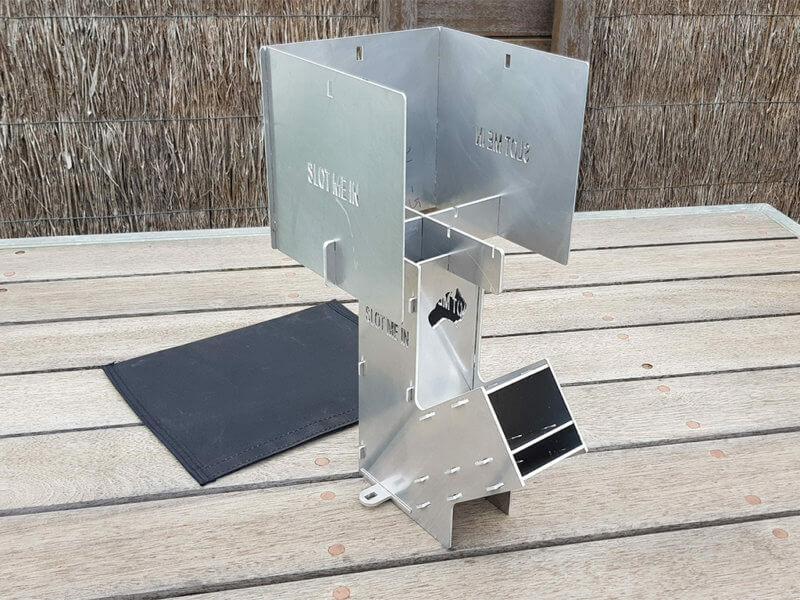 This is the third model rocket stove in our range of products now. And yes you read that correctly a FULL ALUMINIUM ROCKET STOVE.